You’ve spent a long time preparing for this hunt, and and when you finally head out to the woods on that frigid November morning, you definitely want to put your best foot forward. Or maybe up. There are so many things to worry about when you’re hunting. Climbing into your tree stand shouldn’t be one of them. The right product can have you scurrying up that tree like an animal all while keeping you safe and secure. So here’s our guide to choosing your climbing sticks. We’ve got a detailed explanation of just about every aspect of climbing-stick design and use. We’ve also got reviews of some of the most impressive products on the market today so you can make an informed decision and get to your stand that much quicker, quieter and easier your next time out. What makes a good climbing stick? All hunters carry a lot of gear, but bowhunters especially. On top of your calls, rangefinder, binoculars, you don’t want to add something heavy to your pack just so you can get up in the tree. 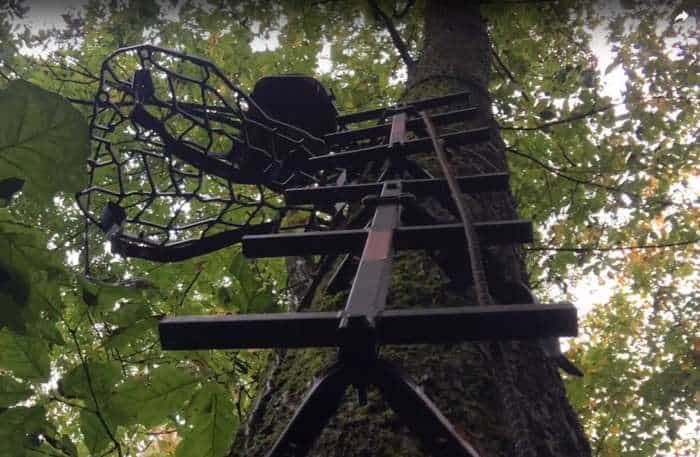 A big benefit of hang-on tree stands is that while still being highly mobile, you can leave them in the woods, so you don’t have to carry them with you all the time. Instead, you can carry lightweight climbing sticks. Since decreasing your gear load is one of the main advantages of hang-on stands and climbing sticks, it serves you to find ones that maximize this. Weight, or lack thereof, should be one of the biggest factors when considering what climbing sticks to buy. Good climbing sticks fall at the ideal intersection of strength and light weight. Durable metals like steel make climbing sticks stable and secure, so you can climb without fear of collapse. Keep in mind that your sticks should be rated for well over your own bodyweight because on top of your potentially heavy boots and camo, your steps will add some extra force. All of our picks are rated for at least 300 lbs, some of them even more. The height you decide to stand hunt from depends on a lot of factors, but the ideal is usually somewhere around 16-20 ft. If you hunt from higher, you will need climbing sticks that can get you there. Many sticks offer extensions or different heights, but make sure that’s the case before you buy. Another major perk of hang-on stands and climbing sticks is their versatility of use. You can set a hang-on stand up in nearly any tree. Once again, you don’t want to defeat this by getting climbing sticks with limited use. Good climbing sticks have versatile attachments. These can be different things like large straps or V-Brackets, but the point is the same. You should be able to attach your sticks to a wide variety of trees. Like with anything, you don’t want to invest in a product only to have it fall apart after just a few uses. Your hunting equipment should definitely be durable. You’re probably going to expose it to harsh weather, changing temperatures and repeated use. Pay attention to the quality of construction in the climbing sticks you choose. A good product could last you season after season, saving you tons of money in the long run. Climbing into your stand is the worst time to make a bunch of noise. If you’re too loud, you spook surrounding game, and your hunt’s over before it even starts. You should find climbing sticks that don’t rattle or clang when you step on them. Ease of setup is important too. The longer it takes and the more complicated it is to put up the sticks, the more likely you are to accidentally make noise. One area where climbing sticks really differ is the design of the steps. There are dual steps and pivoting steps, and some stands use things like standoffs to push the sticks off the tree and give you a deeper step. Different kinds of steps might have different advantages for different people and situations. For instance, a deep step is great for someone with thick heavy boots or even just big feet. The right step sets you up for success when it comes to climbing. If you’re using a hang-on tree stand, portability is probably a top concern for you. In that case Lone Wolf has you covered with their climbing sticks. For starters, they weigh in at only seven and a half pounds total. They’re also compact and stack together tightly, so you can carry them without any problems. Besides being highly portable, they get you up in your stand fast. They come with a Versa-Button strap attachment that lets you set them up or remove them right or left handed. The steps also pivot to either side, so climbing is a breeze. The sticks attach with a swiveling V-Bracket which is really nice because you can use them on nearly any tree. Plus, the single-tube construction lets you fit it between branches. If you need them bigger, you can get the 32-inch extension. Altogether, these sticks are a great option for the highly mobile bowhunter. It’s hardly easier to climb up into a tree using a ladder. In the end that’s basically what the Fast Sticks are. The design is tough steel in a three-section design. This gives you a lot of different footings and enough versatility to scale trees of all sorts of different shapes and angles. The downside of this design, though, is the heavy weight. Each stick is five pounds, which adds up to 15 pounds total. First consider how far you’re going to have to carry them. You can set these up fast thanks to quick-connect cinch-down straps. They also make your climb nice and secure. The sticks are rated for 300 lbs. Last but not least, they’re a quality product that comes at a great price. Sturdy climbing sticks like these can be a good bet for bowhunters new to stand hunting. If climbing sticks make you a little nervous, and you’re looking for something a bit sturdier, you might opt for this stick ladder. Instead of several separate climbing sticks, it’s one long one that you can use like a ladder. If you do go for this option, know that it’s on the heavier side at 17 lbs. But with this weight you get 20 ft of height, plenty for almost any stand hunter. It’s also made of strong steel that adds to the security. Besides the construction, Millennium added some other safety features. There’s a dual top step that makes climbing even more stable. It also has built-in standoffs, so you have more room for your feet as you’re stepping. We recommend it for anyone with heavy boots or a lot of gear in general who needs solid full-footed steps when they’re climbing. Finally, this stick ladder has a huge seven-foot cam-buckle strap. This gives it a lot of versatility because you can attach it to even larger trees. It meets industry standards and is rated to hold 300 lbs. These climbing sticks’ claim to fame is their innovative gravity-forward design. Once set up, they angle inward toward the tree. This shifts your center of gravity forward and has several great benefits. For one thing, it’s extra safe. Leaning forward, you’re a lot more balanced and less likely to fall. The stick ladder itself is more stable, too, since you’re pressing it into the tree rather than pulling away from it with your own weight. It’s also just way easier. An angled climb lets you use your legs and arms more effectively to lift your bodyweight. This way you get less fatigued. This means more focus and less sweat to give off scent that could spook game. These sticks come in an all-steel construction that is really heavy but super stable as well. The steps are wave cut and double spaced, so you have a more secure footing. It could be a good fit for private-land hunters who want something strong but mobile they can put under their stands. It’s available in both 16 and 21 ft.